At up to five-feet tall, this flightless bird is the largest of all South American birds, weighing up to 90 lbs. They are related to ostriches, emus, cassowary and kiwis. They have three claws on each foot of their long legs to help them outrun danger. Their five-foot wingspan helps with balance and changing direction as they run. They have fluffy, tattered-looking gray or brown plumage. Males are usually darker in color than females and are generally larger than the females. Open grasslands, grassy wetlands and sparse woodlands. Native to Argentina, Bolivia, Brazil, Paraguay and Uruguay. They enjoy tough plant matter, fruits and seeds but also eat insects, lizards, birds and other small game. They sometimes swallow pebbles to help grind down their food for easy digestion. 15 years in the wild. 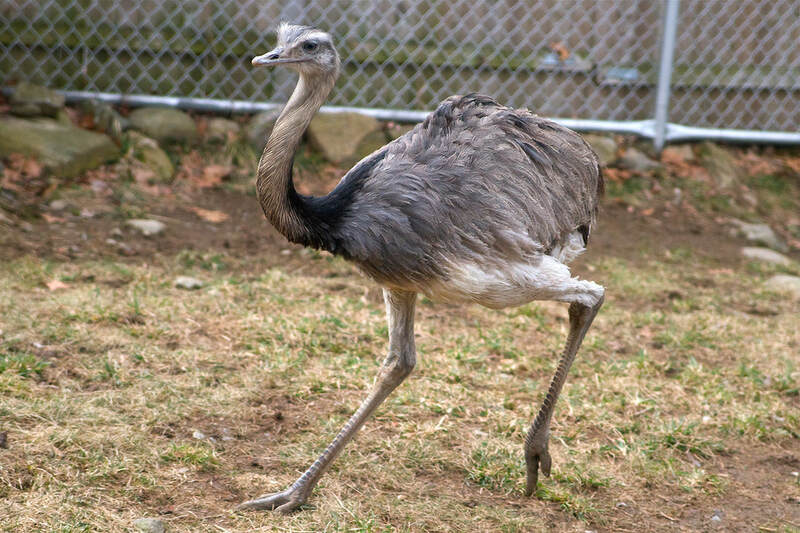 Rheas breed in the warmer months, between August and January. Males have many different mates. Females lay their eggs, one every other day for a week or ten days, in a ground nest that the male builds. Several females deposit their eggs in the same nest, which may hold 50 or more eggs. The male hatches and raises the young. Once the eggs are hatched, he continues to rear the chicks, guarding them from any potential threat, including humans and even female rheas for the first six months. In winter, rheas are social and flock together. They often congregate with other large animals, such as deer and guanacos, and form mixed herds. Near Threatened due to increased hunting. Rheas are among the world’s largest birds. Upon hatching, they are even larger than adults of many bird species. 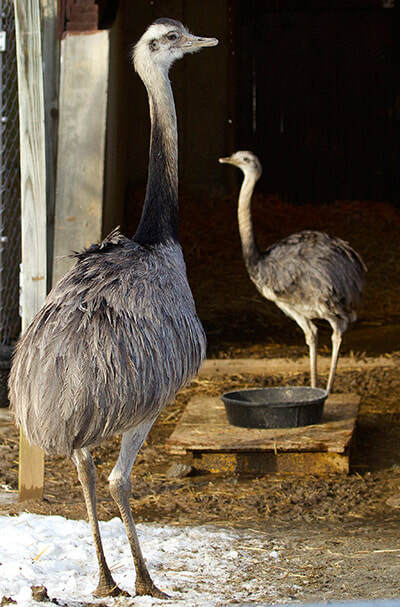 Look for our “little” rheas in our Farmyard. They grow so quickly, and you don’t want to miss them. Before you know it, they’ll be looking you in the eye!